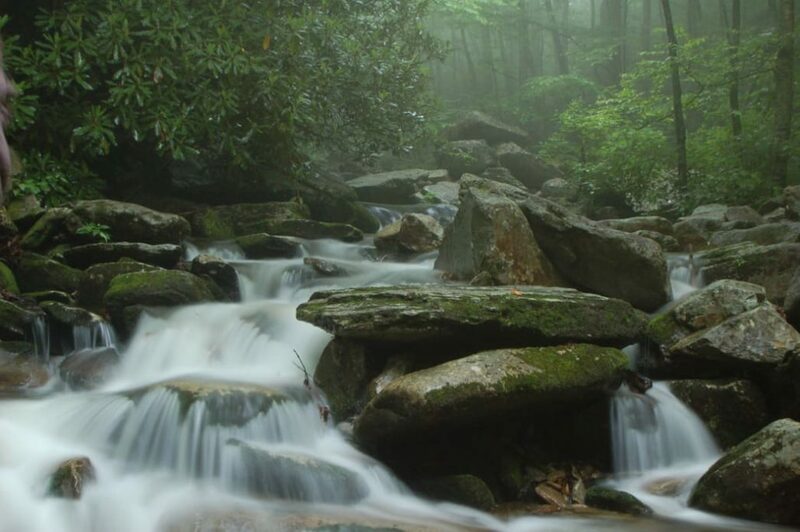 The Boone Fork Trail is renowned not only for the sultry beauty of the mountains it passes through but also the range of ever-changing terrain that one will encounter on this dynamic five-mile loop. The hike begins and ends in Julian Price Memorial Park, a swath of land comprised of 4,200 acres of dense hardwood forest and rolling Appalachian Mountains. The trail’s namesake river, the Boone Fork, will intersect your path at multiple points along the way, but never with the same temperament. It firsts appears as a flat and docile stream, then transforms over the next few miles into a roaring cascade, tumbling through a garden of cracked granite boulders. As you near the completion of the trail, the river once again becomes placid, cutting through floodplains that, in the summer months, are choked with wildflowers. Your hike will begin with a gentle climb through soft, undulating hills that give way to cow pastures, meadows and marshes as the din of the river grows and fades in the background. In the heat of summer, you will be grateful for chilled rhododendron tunnels and tall, shady coniferous trees. The gradient for the majority of the trail is moderate, making it a popular loop for trail runners. A few moments of steep climbing, timber cut steps, and one wooden ladder may present a challenge to children, small dogs, and anyone not dressed for the slippery and uneven terrain. Other obstacles include rock hopping, stream crossings, and brief sections of mud. The pinnacle of this hike is Hebron Rock Colony, a jumble of flat-top boulders so thickly dispersed that the river all but disappears beneath them. This unusual feature cuts into the hillside like an ancient highway, providing an idyllic spot for sunbathing and picnicking. In certain areas, water splashes over granite tongues, creating a natural water park that will prove irresistible on sweltering summer days. Farther along the trail, rock outcrops provide views of iconic Grandfather Mountain and Hanging Rock. Long range mountains views are secondary, however, to the immediate splendor of a lush, river-fed landscape, wide open fields, and waist-high wildflowers. Not long after embarking from the parking lot, you will find yourself feeling completely immersed in an ethereal beauty reminiscent of a watercolor painting. Although swimming spots and sunny meadows make this hike a popular excursion in spring and summer, Boone native Ambrose Park advises paying a visit in the offseason as well. To access the trail, cross the footbridge at the Price Park Picnic Area, mile marker 296.4 in Julian Price Memorial Park. Allow yourself three hours of daylight to complete this hike.